I have been to most countries in Europe but I have never been to Finland. I really don’t know much about the country except for a couple of hockey players and Formula 1 drivers who speak in a flat toned voice with absolutely no emotion whatsoever. But this much I do know about Finland - I know that Nokia is from Finland. In fact, it is one of the national icons of Finland. I suspect that the CEO of Nokia is more influential in Finland than the president Tarja Halonen, even though she been a topic on the Conan O’Brian Show a few years ago. On Feb 11, 2011, Nokia announced the plan to adopt the Windows Phone 7 mobile operating system (MOS) on its smartphones in favor of the Symbian MOS they were using so far. This move is not a major surprise as Nokia, once the dominant leader in mobile phones, has been rapidly losing market share over the years. 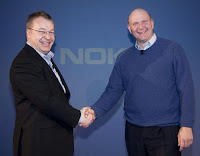 Also, the new Nokia CEO Stephen Elop came recently from Microsoft and since no story of Steve Ballmer throwing a chair at him appeared this time, he must have left on relatively good terms. The move towards Windows Phone 7 is significant. It gives Microsoft a strong ally in the mobile wars which have been raging since 2007 when Apple launched the iPhone. It is definitely a great move for Microsoft which has finally started to take mobility seriously with the launch of Windows Phone 7. Microsoft’s previous attempts in mobility were lackluster at best and Microsoft needs to gain market share quickly to come at least in sight of Apple’s and Google’s taillights. Nokia will absolutely help Microsoft. But is this move the best for Nokia? The problem is the lack of apps on Symbian. From the app vendors point of view, Symbian is at best the number 5 mobile platform on the market, trailing behind Apple iOS, Google Android, RIM BlackBerry and Microsoft Windows Phone 7. Just getting to position 4 means beating Microsoft which is a big mountain to climb. Of course Nokia could have sold out - get acquired by another company that could afford the $35-40 bln market capitalization. Selling out is rarely the intent of a new CEO unless he or she got hired for that specific purpose. I guess we know the answer now. The possible suitors could have been Google and Microsoft as both companies attempted to sell their own devices in the past and failed. I’d argue that the merger with Microsoft is still a possibility down the road. Nokia could have teamed up with Google and embraced the Android operating system. That would have gotten them to position 2 in mobile platform rankings which would give them instantly thousands of apps. The Android MOS is open sourced and so there is no royalty to pay to Google. The disadvantage would have been the difficulty to differentiate with Samsung, HTC and other Asian manufacturers who have already started offering Android-based phones and tablets months ago. I’ve shared my impressions about the Android-based Samsung Galaxy tablet recently. 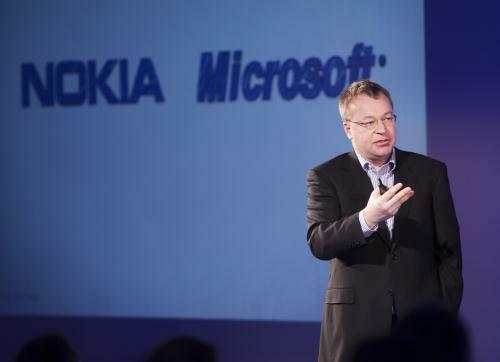 Teaming up with Microsoft was a predictable choice given Stephen Elop’s Microsoft background. This move gets Nokia to position 4 in the mobile platform rankings with a fighting chance to eclipse BlackBerry should RIM stumble with PlayBook. But that’s about it. The number 4 mobile platform is not going to get as many apps built as the top 1-2 and what they need are apps, apps, and apps. With Microsoft, Nokia found a powerful marketing ally but Windows Phone 7 isn’t open sourced and Nokia will have to pay royalties to Microsoft. Also, differentiation is not a slam dunk since Samsung, HTC and other manufacturers already ship Microsoft-based phones. I’ve also considered a scenario of Nokia merging with RIM and embracing the BlackBerry OS but since the companies have virtually equal market capitalization, I have dismissed this scenario as a viable option. Obviously, Stephen Elop has opted to go with Microsoft and take advantage of a powerful and motivated ally with the risk that even this combination might not succeed to win over application vendors. And even if that battle succeeds, Nokia will have difficulty to differentiate. Within 12 months, all the devices will have every bell and whistle and with the same OS and the same apps available, the battle will be probably fought on price. And that’s not an enviable position to be in. The reality is that Nokia had to make a move and the new situation is decisively better than the situation before. Possibly, Nokia might end up licensing Android in addition to Windows Phone 7 just like Samsung and HTC do. Or they might sell out after all - most likely to Microsoft. In either case, both companies have their work cut out.